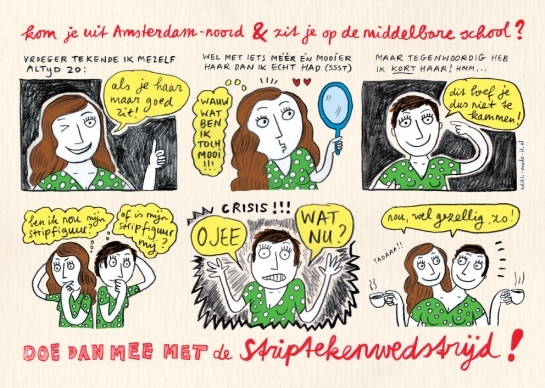 This winter I will be assisting cute illustrator Edith-made-it in a comic contest in the district Amsterdam-Noord. On the second day of training we learn more about one of those expressions that always sound so terrible to me: market research. It brings me back immediately to the big F on my economy exam. Marca van den Broek knows no “ah well…”. Filled with enthusiasm, she tells us how we can get a better picture of our customers in a good and pleasant way. Our heads are being stuffed with information. Terms that previously sounded like abracadabra are becoming surprisingly simple. The homework: making a competitor analysis, taking a customer survey and having informative talks with (successful) people in my network! The questions I want to ask my customers are coming to me very quickly. What fun this is! I am becoming more and more curious how my work is seen by the people around me, especially by potential buyers. Behind the scenes I am continually developing my style. For the Voor de Kunstenaar exhibition everything must come together, so from that moment on I can ROCK in acquisition. Will the people who will be filling out my survey also be most attracted to the work that is closest to my own handwriting? Today, at an amazing Etsy Lab at Dutch Design Week, I met Myrte de Zeeuw and fell in love with her work! Aren’t the detailing and colouring of her illustrations amazing? See more of her stuff here: http://www.lovemyrte.com/shop/en. Etsy exists to bring heart, meaning, and community back to commerce. We envision a world where individuals and their small businesses shape economies that are fair, durable, and fun. Here, we value the people and the stories behind the things in our lives as much as we value price or convenience. 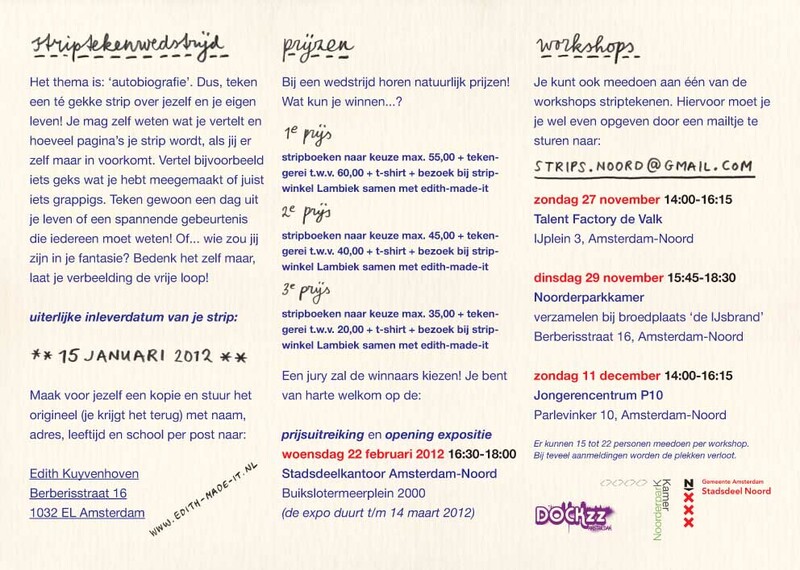 During DDW we will therefore focus on the story behind ’the maker’ and ’their product’. We want you to “Make your story” during our DDW Etsy. We will literally show you how to “make” your story from beginning till end. You will leave this labs with your first storybook! It will be also your chance to meet our Creative Director Randy J. Hunt (NY)! Well, I met Randy J. Hunt and was impressed by this guys visions of a better world. Such a kind, intelligent and calm person. I know the story I have to tell will be about making my career switch to a more creative life, but still have to find the right words to do so.